The Mattress Underground Welcomes LUMA Sleep! In March 2017, we welcomed Luma Sleep to The Mattress Underground community. Luma Sleep was launched in May 2015 ( see here ), and they are one of the newer online mattress companies that have been created since 2014 that focuses on value-priced luxury mattresses. Knowledge & Experience: Two of Luma Sleep’s founders, Steve Russo, and Jim Siragusa, have a combined 60 years of mattress industry experience, with much of that in latex. Steve was the President & CEO of Latex International from 2001-2005. Service: They are transparent, flexible, and treat customers on a case by case basis looking at a consumer’s individual needs and preferences. Luma Sleep’s responses to consumer inquiries are prompt and backed up by their extensive experience in the industry. Value: Luma Sleep offers a free one-year comfort exchange and on their 3” Latex Comfort Layer used in the Latex Hybrid Slumber System and All-Latex Slumber System. Engineered in the design of their Slumber System lines, Luma Sleep offers a free Aller-Free mattress protector and two free Talalay latex pillows to help with the spinal alignment in the neck area. They offer a free 100-night in-home trial with a full refund. Luma Sleep’s systems design accommodates for future changes which take into account customer’s changing needs and sleep posture over time. Consumers who buy their lines can exchange layers and/or purchase new additions to make it perfect for each customer. The prices of Luma Sleep’s mattresses is competitive with other quality manufacturers and online retailers. The company also sells Leggett & Platt adjustable bed bases, Talalay latex pillows and toppers, RTA foundations and Sleep & Beyond organic cotton sheets. Discount/Bonus offered for TMU members is 10% or more off of mattress purchase. If you have questions about Luma Sleep, feel free to use the forum search tool or you can create a member account and start a new topic thread with any specific questions you might have. I was under the impression that all of the pocketed coil units were zoned and not just with an additional charge. Maybe I've misread their statement when they say progressive back support as meaning something different. You’re not misreading any statement , but I think you’re interpreting it to mean the wrong thing. Progressive support in foams or innerspring units refers to the “firming up” as the item is compressed more and more, and it gives at a different rate. This is commonly referred to as the compression modulus of an item, for example taking more force to compress a piece of foam or a spring unit 65% of its total height than 25% of its total height. Zoning would be providing different comfort zones, usually under the hips, back, and shoulders. This can be done with foams, or in this case, with a different spring unit (the Combi-Zone). Both of the spring units in questions offer very good support and are part of the Quantum Edge steel perimeter edge system. I just ordered a Luma Hybrid sleep system yesterday. I ordered the plush+ which is between plush and medium. We've been sleeping on a Comfortaire for 20 years. It's served us very well, but we're looking forward for the change. I'll share our thoughts once we get it. So far customer service has been top notch. Congratulations on your new mattress! As you're already aware, Luma Sleep is a member here, which means that I think highly of their products and advice. You certainly made a good quality choice. I'm glad that you've received good service so far, and I'll be looking forward to those comments on your mattress once you've had a chance to sleep upon it for a while. Great post!! Thanks for sharing on your new Luma mattress! Luma Hybrid sleep system is the best mattress in the market, They have been business almost 20+ years. Their customer service is also good. I recently use their customer services its better then other Mattress services. Is Luma's blended talalay made with safe materials? 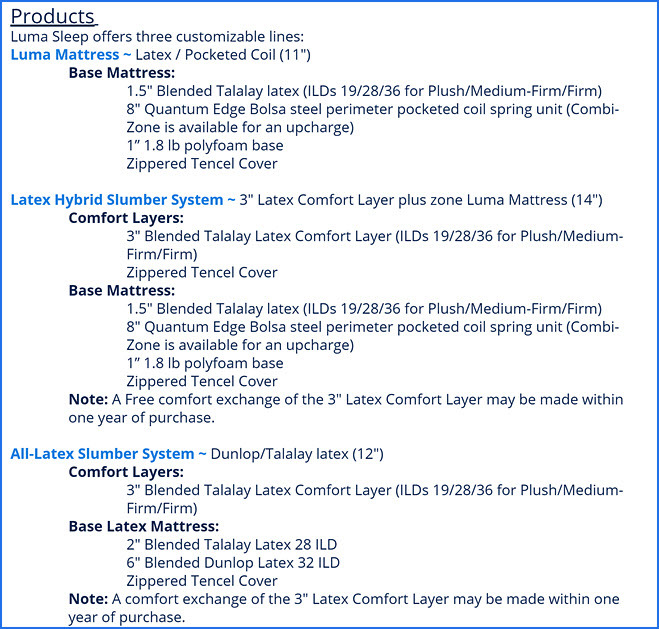 The blended Talalay latex used by Luma Sleep is from Talalay Global, and is Oeko-Tex 100 Standard, Class I certified. Class I is the most stringent level for the harmful substances and VOC testing in the 100 Standard for Oeko-Tex. You can read more about this on the Talalay Global site in their FAQ , and also here from Oeko-Tex . The only reliable way to assess the "safety" of different materials in more general terms is based on lab tests and the certifications they have for harmful substances and VOCs (regardless of whether they are organic or natural or synthetic) so that you have some assurance that the VOCs are below the testing limits for the certification. If the materials in a mattress or the mattress itself have a reliable "safety" certification then for most people they would certainly be "safe enough" ... regardless of the type of material or the name of the manufacturer on the label. All the latex you are likely to encounter (either Dunlop or Talalay that is made with either natural or synthetic rubber or a blend of both) will also have a reliable certification such as Oeko-Tex, Eco-Institut, Greenguard Gold or C2C and based on actual testing I would consider any type or blend of latex (regardless of whether it is synthetic, natural, or blended) to be a very "safe" material in terms of harmful substances and VOC's (off-gassing). So we've had the Luma for a month now. We are very happy with the purchase. It's very good quality. Its rather heavy and the materials seem top notch. The mattress is very tall. I personally doubt I could sleep on it without the 3" top layer though. You can feel the springs when you touch the side of the mattress. I would think as time passes, the sides of the mattress would be the weak link and might show a failure first. If we can enjoy this for 8-10 years without issues, we'd be happy. Thank you for the update! I’m happy that you’re sleeping well on your new Luma Sleep Mattress . I hope that you’ll have the time to provide future updates on the performance of your mattress. You can feel the springs when you touch the side of the mattress. I would think as time passes, the sides of the mattress would be the weak link and might show a failure first. If we can enjoy this for 8-10 years without issues, we'd be happy. This mattress uses the Quantum Edge (either the Bolsa or Combi-Zone) innerspring unit from Leggett and Platt, which features a firmer and more supportive double row of springs around the perimeter of the mattress (which is what you feel), replacing the innerspring foam encasement used by many manufacturers. The Quantum Edge is more durable than the foam edge reinforcement that it replaces, and it would not be a weak link of the mattress. With the quality of componentry in this product, an 8-10 year comfort life would be a very reasonable expectation under normal use.